Do you run a spa or hammam in Rome? Maybe a hotel in Milano? Or maybe a wellness centre in Venice? Enhance the environment of your institution with the traditional Turkish towels that match Italies cultural aspects perfectly! Key to a successfull business is happy customers! And once your customers notice that you pay attention even to the smallest details, and once they understand you work hard to keep them comfy, they’ll know that they made the right choice by choosing you! What comes after that? Recommendations! They’ll recommend you to their friends. If they come back to your city, they’ll definetly choose you again! But, we assume you already know all of those. We’ll now tell you why our luxurious hammam towels are perfect for your business! 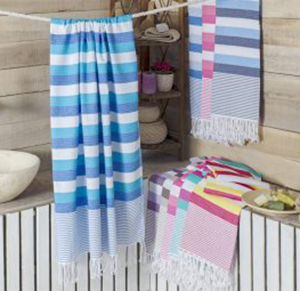 First of all, Turkish towels, originally known as peshtemal and hammam towel, are not only towels! They are more than dull, ordinary towels! Used and improved by the all classes of Ottoman Empire, Turkish towels are an important part of Anatolian culture! Housewives used peshtemals as aprons. Hammam towels were the symbol of mastership among the craftsmen. Garnished peshtemals were used by the rich people & the royal family of Ottoman Empire. People used them in traditional Turkish hammams! In short, Turkish towels are not only towels as we said! They are important cultural elements! As Italy has many beautiful historical locations, decorating your business in Italy with such cultural elements will show your customers that you pay attention even to the smallest detail! This is only one of the reasons why you should choose traditional hammam towels for your institution! Are Turkish Towels More Comfortable? And the dyeing proccess is held in the best dye-house in Denizli/TURKEY. We use premium quality dyes while applying the designs on our hammam towels! Our hammam towels don’t contain any harmful or alergen material on their texture! You can confidently decorate your business with our luxurious Turkish towels! We told you about the heavenly texture & the history of Turkish towels. Now, we want to talk about our designs! As a hammam towel manufacturer & wholesaler, our designers follow the fashion to come up with stylish Turkish towels. We have a design for every type of customer you might have! We have traditional hammam towels for historically designed locations. We have eye-catching beach towel designs for pools & beach clubs. We have elegant Turkish towels for spa centres, gyms & wellness centres. We offer minimalistic peshtemal designs for simplistic locations! In short, we have a Turkish towel design for everyone! We also offer a wide color spectrum for our entire hammam towel collection! You can select the combination of colors that match your business perfectly! You can easily discover our luxurious Turkish towel collection by simply visiting our “products” page! Before we finish our post, we want to mention a couple of important things! Please, don’t hesitate contacting us for any questions about our Turkish towels or for your hammam towel wholesale needs! We’ll be happy to answer all your questions and enquiries! Motto Peshtemal, Turkish towels manufacturer & wholesaler, wishes you a happy year!